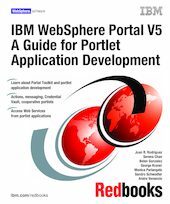 This IBM Redbooks publication helps you design, develop and implement portlet applications using the IBM WebSphere Studio Site Developer and the Portal Toolkit V5. The information provided in this book targets Business-to-Employee (B2E) enterprise applications, but most of the scenarios presented apply to Business-to-Consumer (B2C) applications as well. In this book, you will find step-by-step examples and scenarios showing ways to integrate your enterprise applications into an IBM WebSphere Portal environment using the WebSphere Portal APIs provided by the Portal Toolkit to develop portlets as well as extend your portlet capabilities to use other advanced functions such as cooperative portlets, national language support, action events, portlet messaging, Credential Vault, Web Services and portlet debugging capabilities. Elements of the portlet API are described and sample code is provided. The scenarios included in this book can be used to learn about portlet programming and as a basis to develop your own portlet applications. You will also find numerous scenarios describing recommended ways to develop portlets and portlet applications using the APIs provided by the IBM WebSphere Portal Toolkit. The sample scenarios in this book have been developed using the WebSphere Studio Site Developer but they can also be developed using the WebShere Studio Application Developer. A basic knowledge of Java technologies such as servlets, JavaBeans, EJBs, JavaServer Pages (JSPs), as well as XML applications and the terminology used in Web publishing, is assumed.